The U.S. has fallen behind other nations in science and math education but there is another related issue and that is of the gender gap that exists within S.T.E.A.M. related-careers. We need to motivate young kids to pursue these subjects to keep up with the rest of the world; and must start earlier, building interest in girls, as it is critical to their future earning potential. 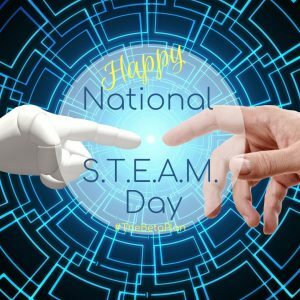 November 8 is National STEAM Day…a day meant to inspire kids to explore and pursue their interests in Science, Technology, Engineering, Art and Math. STEAM is designed to integrate these subjects into various relevant education disciplines. The goals of STEAM are to nurture students to be innovative, train them to think critically, and use engineering or technology in imaginative and creative approaches to real-world problems, while building on students’ mathematics and science base. STEAM programs include art by drawing on design principles and encouraging creative solutions to various challenges. November 8th is a good day to observe and engage in STEAM related activities. The internet is full of ideas but here’s a start – a month-long list of engaging, integrated STEAM activities for you and your kids from Left Brain Craft Brain. You can also celebrate National S.T.E.A.M Day by tuning into the Netflix original series Project Mc², or by visiting www.projectmc2.com where you can become an honorary member of NOV8 and go on super-secret spy missions.